I have been living abroad for almost ten years now, but it's the carnival week-end that brings with it the highest waves of home-sickness (so does the wine-week, which I describe here, but that's not until August). You would expect Christmas to be worse, but it's not. I should have booked a flight home! Maybe it's because I was born on the 11th of November, which marks the beginning of the carnival season every year. It starts exactly at 11.11am (I was born at 11.51am) and lasts until Ash Wednesday (as you may have gathered, eleven is the official number of the carnival). Of course we used to celebrate the carnival every year for longer than I can remember. In my teens, I even danced in the show-ballet of a carnival club for a few years. No wonder I am so attached to it! Every year it's strange for me to spend this week-end calm and quietly, rather than out in the streets dressed in a costume at one of the many carnival parades in my region. 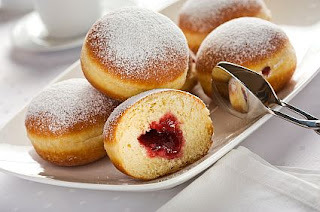 The only carnivalesque thing I managed to do this week-end was to have a doughnut, which represents the closest substitute available in the UK to a carnival cake (in my region, we call them "Kreppel", see blow). The crappy doughnut I managed to find did not taste good, but it felt good! During my time in Oxford, when I had high-table dining rights at Somerville College, I was reminded of the Narrhalla-Marsch during every formal dinner. When the members of the Senior Common Room entered to walk up to the high table, all the students stood up until we had taken our seats in silence. With all the fellows marching in like this, I always felt it was a Narrhalla-Marsch moment. It made me laugh, and once I had thought of it, the Narrhalla-Marsch would play in my head whenever I'd enter hall during formals. Now you know why I was smiling then. My current college does not have a high table, and even if it did I would not be allowed to sit on it... So bad doughnuts are all I have to remind me of the carnival, until I buy a ticket home next year to join in the celebrations once more!